RIO DE JANEIRO, BRAZIL – A mining bill in Brazil aims to create a powerful new independent regulator for the sector, endowed with powers to auction mining concessions and set minimum investment levels for companies. The draft law, sponsored by Senator Gim Argello (PTB-DF) and recently presented to Congress, forms part of a package of measures designed to overhaul Brazil’s current mining code which dates back to 1967. Senator Gim Argello (PTB-DF), on the right, sponsored the proposed law to create a new mining regulatory body, photo by Antonio Cruz/ABr. “The government has a duty to ensure the rational use of mineral resources in response to public interest, observing national security, state sovereignty and sustainable development,” reads the text. The new body will be known as the National Mining Agency (ANM). “The agency, which will replace the current National Department of Mineral Production (DNPM), will have more autonomy and a more efficient organizational structure,” continues the bill. 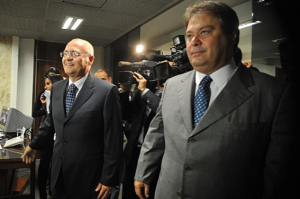 Among the document’s main components is a plan to replace Brazil’s first-come, first-served system of distributing mineral rights with an auction process. A second key element would empower the new regulator to strip companies of mining concessions if they fail to make the necessary investments. According to the bill, the new mining regulator will be modeled on Brazil’s National Petroleum Agency (ANP), as well as its phone and electrical and regulators, ANATEL and ANEEL. Among other important proposals in the text is a call for greater restrictions on the passing of mining concessions between firms, a relatively common occurrence at the moment say analysts. The Carajrás mine, run by Vale in the state of Pará is the world’s largest iron ore mine, photo by Vale press. The draft law is now being studied by justice and infrastructure committees within Congress, with two further bills set to complete the planned overhaul of Brazil’s mining code. One of these will reportedly increase the level of royalties that mining companies are ordered to pay the government, a move unlikely to attract much support from the private sector. Senator Gim Argello is a member of the Brazilian Workers’ Party (PTB-DF), part of President Dilma Rousseff’s (PT) ruling coalition. Plans for a new mining regulator in Brazil come amid a regional trend that has seen governments exert greater control over their natural resources. In neighboring Argentina, the government recently seized a 51-percent stake in the YPF oil and gas company, arguing that the company’s former owner, Spain’s Repsol, had failed to make the necessary investments. 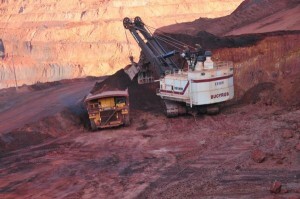 Brazil holds huge mineral reserves and is currently the world’s second largest exporter of iron ore. It is also a major producer of copper, bauxite, nickel and precious stones, and has large untapped reserves of uranium and potash. Brazil’s Vale is the world’s second-largest mining company and the biggest producer of iron ore. Other local companies include Eike Batista’s MMX Mineracao e Metalicos, with foreign firms such as Anglo American also looking to Brazil as a future growth area.